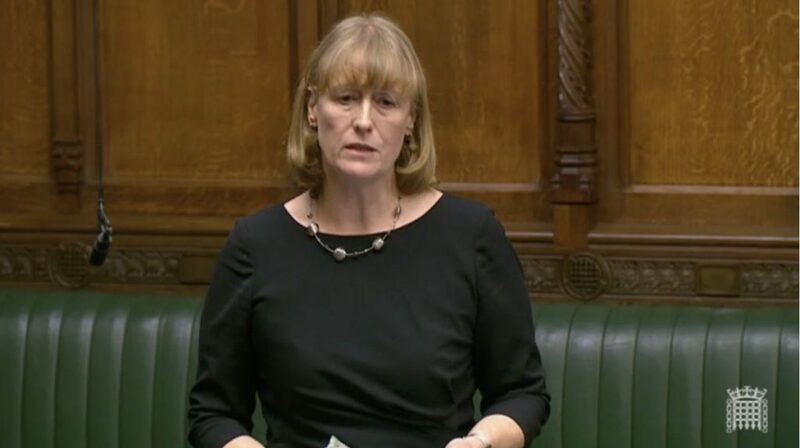 The campaign to persuade the government to proscribe Hezbollah in its entirety will continue, LFI chair Joan Ryan has pledged following last week’s debate in parliament. At the end of the three-hour debate secured by Ms Ryan, Home Office minister Ben Wallace rejected calls from across the House to extend the UK’s ban on the terror group’s military wing to its so-called political wing. Many experts – and Hezbollah itself – dispute the notion that the two elements are distinct. Ms Ryan’s motion won widespread support from Labour and Conservative MPs during the debate, as well as backing from the Democratic Unionist party. It was opposed by both the government and Labour frontbenches. Opening the debate, LFI’s chair argued that, over the past three decades, Hezbollah has “been implicated in a string of deadly attacks against Israeli, Jewish and western targets both in the Middle East and beyond”. Ms Ryan detailed Hezbollah’s “deep-seated, intractable and vicious hatred of Jews”, quoting one writer who has suggested that the group fuses “Arab nationalist-based anti-Zionism, anti-Jewish rhetoric from the Koran, and, most disturbingly, the antique antisemitic beliefs and conspiracy theories of European fascism”. She also outlined Hezbollah’s long-standing desire to destroy Israel – its vehement opposition to the Oslo peace process and its effort to prevent any attempted normalisation of relations between Israel and Arab countries – as well as its pernicious influence in the wider Middle East. Ms Ryan closed her speech by laying out the extensive evidence that the distinction between Hezbollah’s military and political wings is a false one and refuting the arguments of those who oppose total proscription. She dismissed the notion advanced by ministers that banning Hezbollah’s political wing might impede Britain’s ties with Lebanon, where the terror group exercises not just military but political power. LFI vice-chairs Louise Ellman and Sharon Hodgson and parliamentary supporter Ian Austin all delivered powerful speeches backing Ms Ryan’s motion. Mr Austin said Hezbollah had “carried out terrorist attacks and racist murders in the Middle East, in Europe and across the world. Its stated aim is the destruction of Israel but it does not limit its attacks to Israel; it targets Jewish people anywhere and everywhere”. Mr Austin warned of the “carnage and the civilian deaths that could result when Hezbollah start raining down missiles” on Israel in any future conflict, citing recent analyses which suggest that the next conflict between Israel and the group will “will likely be the most destructive Arab-Israel war yet”. Mr Austin also attacked Labour leader Jeremy Corbyn’s previous description of Hezbollah as “friends”. “Who would describe a racist, fascistic and terrorist organisation like Hezbollah as ‘friends’,” he asked. Ms Ellman focused on the fact that the failure to proscribe its political wing had allowed Hezbollah flags to be displayed on the streets of London at last June’s Al Quds Day parade. “That message is clear, menacing and extremely powerful. The menacing chants at the march on the streets of London this year included the heinous cry: ‘Zionists/ISIS are the same. Only difference is the name’. Ms Ryan was also supported on the Labour benches by former defence minister and LFI vice-chair John Spellar who denounced Hezbollah as “one criminal entity” and former LFI chair John Woodcock who charged that the opposition and government frontbenches were “effectively in an alliance in refusing to recognise the bogus distinction between the so-called military wing and the rest”. They were joined by LFI parliamentary supporter Mike Gapes, a member of the Foreign Affairs Select Committee, who referenced the carrying of Hezbollah flags in Al Quds Day parades in London last summer and demanded: “Terrorist activities should not be the only grounds for prosecution … There should be prosecutions for incitement to hatred, incitement to antisemitism and other crimes that are being committed on the streets of London.” LFI parliamentary supporter Graham Stringer meanwhile noted that “as well as being antisemitic, Hezbollah has assassinated and murdered Christians”. In response to Ms Ryan’s motion, Home Office minister Ben Wallace defended the government’s stance. “Although the proscription of Hezbollah in its entirety is kept under review, our current position maintains a balance.” Shadow Home Office minister Nick Thomas-Symonds supported the government. Over 10,000 emails were sent to MPs in the run-up to the debate thanks to the efforts of our friends at the Israel Britain Alliance and We Believe In Israel. Read Joan Ryan’s article for Progress here, her article for Politics Home here, Joan on Daily Politics here, and the full debate here.